Mid-Week Mini: Blackwing 10,001 Review. 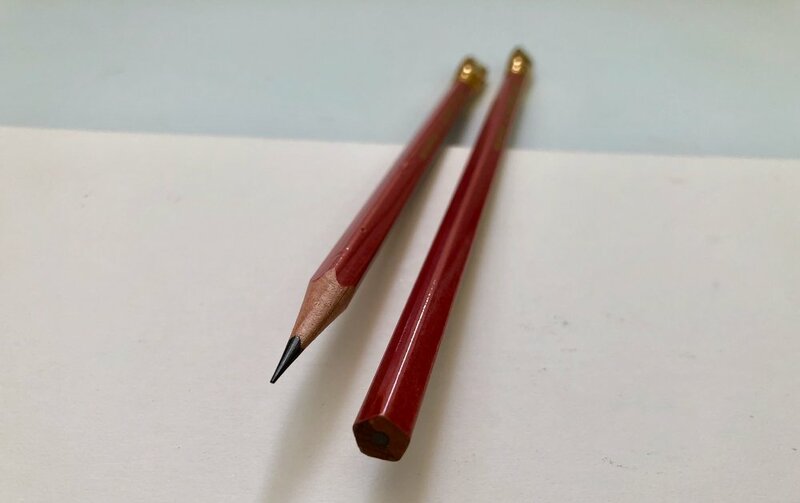 One of the Blackwing limited edition releases from 2018 was the 10,001 pencil, which plays homage to creative ways to teaching and learning specifically linking back to Miyamoto Sensei puzzles. 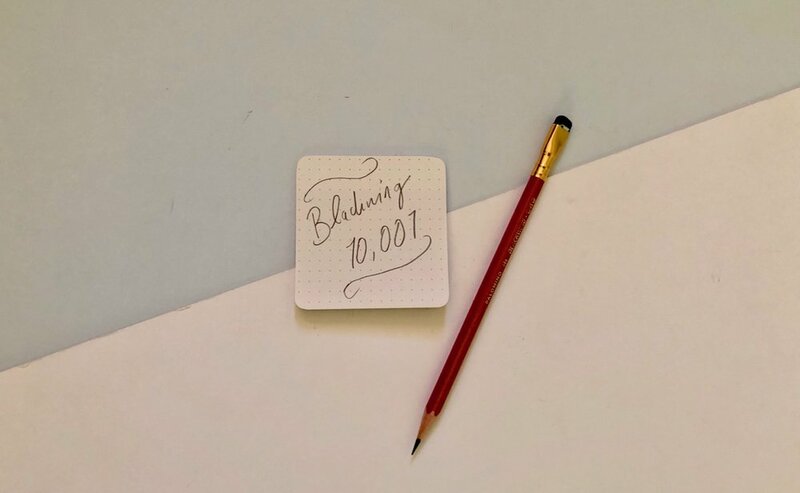 The 10,001 saw Blackwing experiment with a few different aspects. 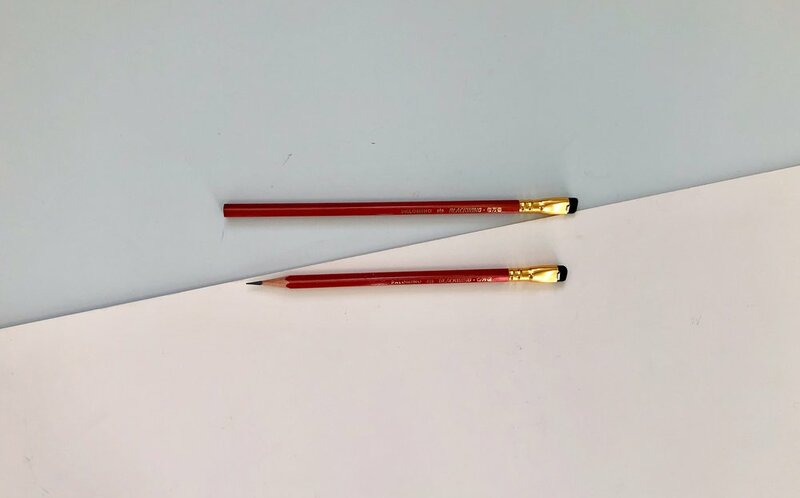 Firstly the barrel is a different shape to the hexagonal barrel of the standard Blackwing pencils and the majority of the limited edition releases. The pentagonal shape of the 10,001 gives it five sides, rather than the standard six. The 10,001 has a firm graphite core, which is quite common among the limited edition releases. However, for this edition it links back to the puzzle element therefore the core had to be firm enough to hold a point. I have found the core nice to write with, the graphite is dark but its really smooth and enjoyable to use. The barrel on the 10,001 is stained red from “adzuki” beans which really gives a subtle colour finish. I really like the light pink tone and you get some of the wooden barrel grain showing through. It almost appears like a wood stain finish. The Blackwing branding is stamped in gold with kanji numerals for the edition number. To compliment the gold printing the ferrule is also gold and there is a black eraser giving it a classic finish. As with all Blackwing pencils they perform well, sharpen nicely and really give you a feeling of quality. They are currently sold out on the Blackwing site, but potentially still available, especially in singles, in brick and mortar stores. Baron Fig Train of Thought limited edition Vanguard. Baron Fig contacted me and asked if I would like to use and review the Train of Thought limited edition Vanguard notebook. All thoughts in this review are entirely my own. 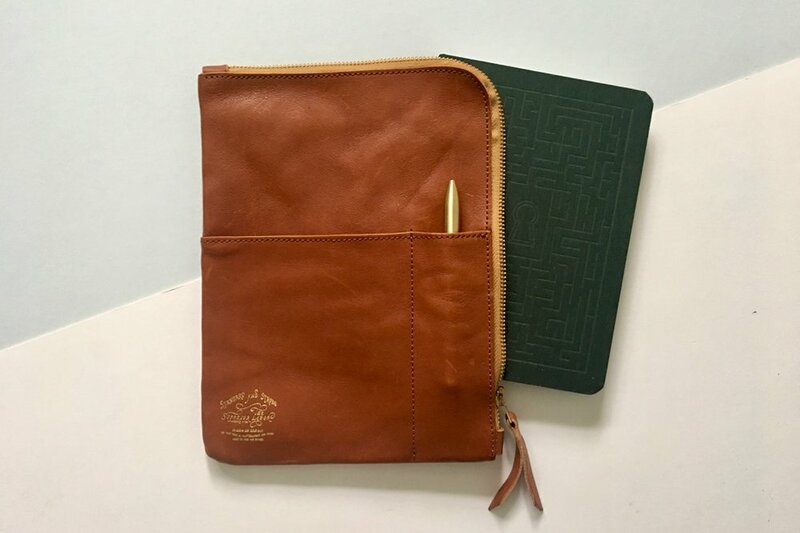 The Train of Thought limited edition Vanguard notebook was a collaboration with a designer, Zipeng Zhu, who featured in Baron Figs bag Kickstarter campaign. I have been using these Flagship sized notebooks for some time now and wanted to share my thoughts with you in todays review. The Train of Thought notebook has some very striking cover designs. Each notebook has a section of a train on the front and back cover and has a different colour - purple, green and red. The artwork continues to the inside cover with each notebook expanding on the theme of seeing where your thoughts take you. 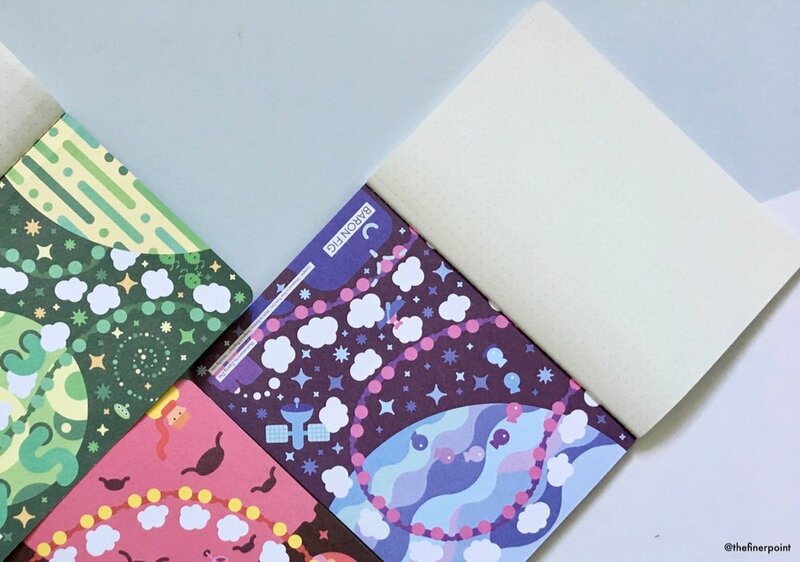 The purple notebook has a sleepy night time feel with animals and clouds floating through space. The green notebook is more of a traditional sci-fi take on space with planets and aliens and finally the red notebook is playful with doughnuts, people and flowers floating through space. Playful, fun and colourful designs. The artwork is playful and fun. Its randomness definitely works with the theme of seeing where your ideas take you. As this artwork consumes the covers both inside and out there isn’t the usual information box on the inside cover which does mean theres no room for personal info, but really who cares. The paper is the normal Baron Fig stock with dot grid ruling inside. The performance is as you expect from Baron Fig products. They take pencils well because the paper has some tooth, fountain pens and inks ar suitable as there is little / no bleed through or shadowing. Essentially you can use most writing tools and you’re fine. The Vanguard notebooks are solid, with 72 pages per notebook and three notebooks in a pack. I really enjoy their size and the slim form factor because they are comfortable to use and write in for long periods of time. They’re kind of the perfect size with he perfect amount of pages. You can still get your hands on the Train of Thought limited edition Vanguard notebook, so head over and snap some of these notebooks up. Thank you Baron Fig for sending me these notebooks to review. Baron Fig sent me their latest limited edition, Lock and Key, to review here on the blog. All thoughts on these products are my own. This is the second double limited edition Baron Fig have released and this time they bought out the big guns! The difference between this edition and their first double limited edition release, the School Set is you can buy both parts separately, presumably due to the high cost of the Squire pen. Both parts of this limited edition are the Lock - the Confidant notebook and the Key - the Squire pen. The Lock is packaged in the usual Baron Fig box. I really appreciate these boxes and often used them to store my unused / used Vanguard Baron Fig notebooks. It’s almost a way of keeping them orderly. Anyway… the box is the same emerald green colour as the Lock notebook but with includes lovely gold detailing. 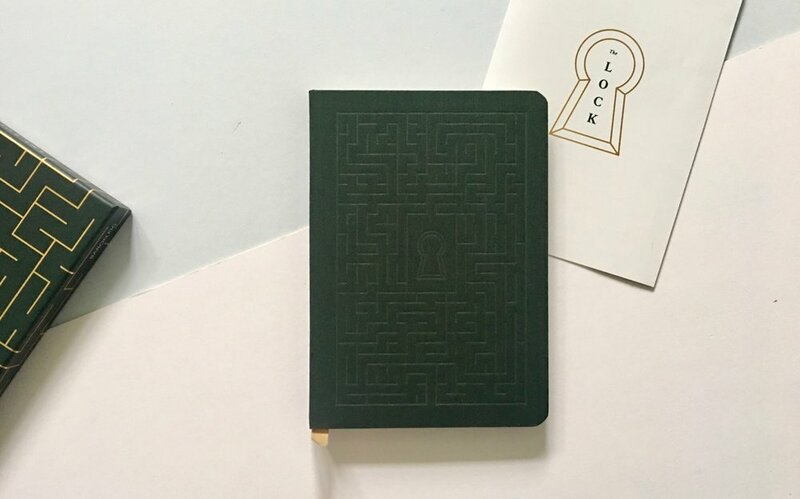 Inside the box is a try-fold leaflet with a poem laying out the intention of this limited edition notebook and inside the maze or riddle that you’re supposed to be solving. The gold foiling on this leaflet is really impressive especially on such bright white paper. It really glows. As I mentioned the Confidant is an emerald green colour which has a maze pattern embossed on the front and back. The colour is really nice, it looks almost regal and definitely classy. The theme continues on the inside cover and title page with the white and gold maze pattern. The paper inside is the normal and ever popular dot grid (I’m dreaming of a limited edition Confidant ruled notebook). To finish it off there is a gold bookmark to compliment the theme throughout. I have used several of Baron Fig Confidant notebooks, a couple of which have been limited editions and the Lock continues an impressive Confidant limited edition design series. The Lock is the second time Baron Fig have gone for a full embossed cover and I really liked it, it works so nicely with the linen covers giving a second layer of texture. The second aspect to this limited edition is the Squire, or the Key. The idea here is that with both parts you can solve the riddle, and there may be prizes from Baron Fig if you get it right. 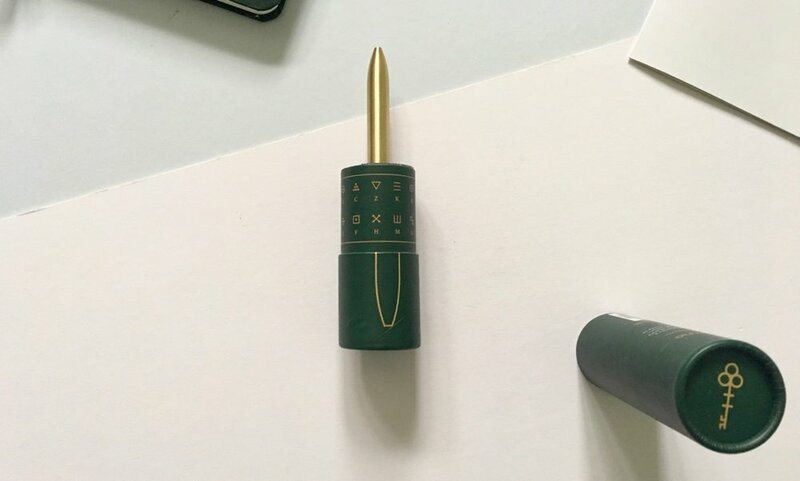 The packaging for the Squire comes in the usual tube but this one comes with an alphabet and symbols relating to each letter, hence the name the Key. Paired with the Lock Confidant notebook in theory you should be able to solve the problem Baron Fig have handed us. I am hopeless at this kind of thing and therefore got nowhere in solving the riddle, useless I know. Rather than other limited edition Squire pens, the key isn’t just a paint job. This time Baron Fig have really changed things up giving us a brass Squire. They could have just gone with a gold coloured aluminium pen to keep in with the theme, keep their costs down and perhaps make it appeal to a broader auidence, but they didn’t and chose to try something different. There is no doubt that this limited edition Squire looks good. The gold colour works well and the edition etching of the key is hidden, unless you’re looking you’re not going to see this. I really liked my first experience with the Squire, The Insightful Spectre. It’s a pen that is perfect for using on the move, there are no caps to use, it’s small and takes a refill I have really grown to like. The Key is different though because it’s made from brass which instantly changes up the weighting on this pen. It’s not horrendous but if you own a Squire already, there is a huge difference. Aesthetically the Key is the same as other Squire pens, the same twist mechanism, the same refill, the same tapering design, the same size. I have quite liked all of these features in my Insightful Spectre and the smallish size again was a bonus for me. With the Key I think I will enjoy using this but not for long periods of time as I think I’d tire very quickly due to the doubling of the weight. There does appear to be a glitch with my Squire where the twist mechanism seems to unscrew the pen and not just pull in the refill which has been a little irritating in the use I’ve had so far. I think this is a cracking limited edition release from Baron Fig. The Lock Confidant definitely ticks a lot of boxes and I really like the colour scheme of this release. The Key Squire is really very nice and considering it’s only $10 more than a Squire pen its great value for money. Baron Figs Squire pens rarely last long so if a shortish brass pen is your bag then I would snap one of these up while you can. I like that Baron Fig are making exciting releases and finding ways of linking up their product range. It sort of forces you to consider more of their product range rather than singular products. While doing this the limited editions aren’t too far removed from what the base of the original product is about. It’s a difficult thing to get right, but so far Baron Fig are doing it well. 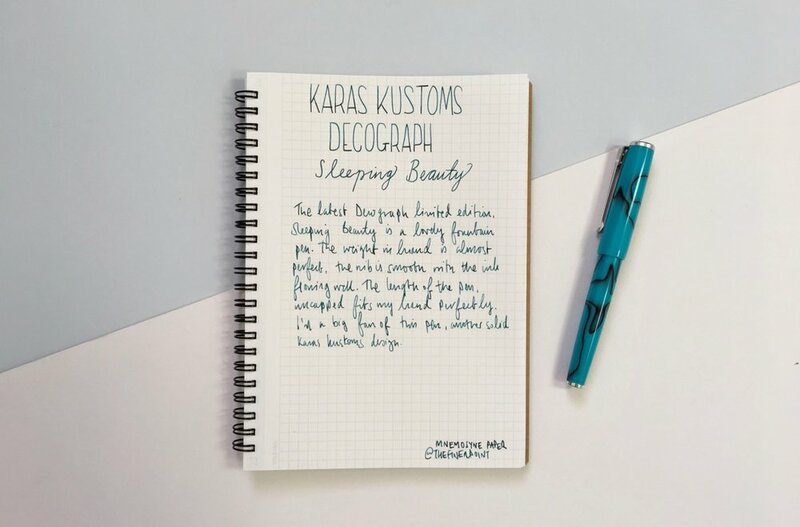 Karas Kustoms Decograph 1801 Sleeping Beauty Limited Edition Review. Karas Kustoms contacted me some time ago to ask if I would like to use their latest signature limited edition fountain pen, the Decograph. I have been using this pen for some time, all the opinions and thoughts shared in this review aren’t influenced by Karas Kustoms in any way. I have been using the 1801 ‘Sleeping Beauty’ Decograph for some time, months in fact. The Decograph is not my first experience with Karas Kustoms pens, I own a Retrakt and an Ink fountain pen both of which I enjoy but in very different ways to the Decograph. This limited edition is the 1805 Sleeping Beauty. Its name is taken from the blue colour of the pen which is inspired by turquoise mines found in Arizona, where Karas Kustoms is located. I don't really often mention packaging on the blog, because really who cares. But the Decograph deserves some attention here. This is one of the nods to Karas Kustoms specialities, working with aluminium. The Decograph is packaged in an aluminium tube with the Karas Kustoms logo stamped on the front. As this is an aluminium tube its heavy. This tube provides serious protection to the fountain pen, perfect for shipping but also for storing your pen when you’re not using it. I was genuinely wowed when I opened the box, I wasn't expecting anything like this, and it’s very different to how the Ink and Retrakt came to me. I presume this is all part of the signature line. The Decograph is a move away from the traditional Karas Kustoms materials. It’s made from a thermoplastic or acrylic-like material which they have combined with their distinctive aluminium finishes. The blue acrylic has a black swirling pattern moving through the pen body that is similar to other acrylic pens. I really like the blue used in this edition because its bright and vibrant. I expected it to be semi-transparent but in fact it’s not, it’s a solid blue. I like this because you aren’t distracted by the inner workings of the pen and seeing the convertor which is pretty boring, instead you concentrate on the beautiful colour and design. The defining features of the Decograph come from the aluminium flourishes. The sturdy pen clip and the aluminium cap top and bottom. There’s a subtle Karas Kustoms logo nestled on the underside of the pen. The aluminium is almost a brushed finish which looks nice in the overall design. The contrast of the plastic and aluminium helps to add some weight to the pen but also finishes everything off really well making it look and feel like a premium pen. Each limited edition pen comes with the model number and pen number etched into the side of the pen. Each limited edition has a limited number of available units and you can track your unit number on the pen itself. Model number and pen number subtly hidden in the pen barrel. The nib and using the Decograph. Karas Kustoms Decograph uses a #6 Bock nib. I am not sure what nib I have here, I am presuming a fine but it writes beautifully. The nib is smooth and the ink flows well. The #6 Bock nib is the right size and fits proportionally with the Decograph, anything smaller would have looked odd. I have used the convertor provided with the pen using my Pilot Iroshizuku Syo-Ro, one of my favourite inks that matches so well with this pen. I have used this pen a lot over the last few months because I enjoy it so much. It’s really nice to write with and the light weight makes it a really comfortable to use for long periods of time. I have used my Decograph almost every day which shows how much I have enjoyed this pen. I’ve tried to think about how to summarise the Decograph and do the pen some justice. When you look at this pen it’s clear its made by Karas Kustoms. The simple, classic shape plus the high end aluminium finishing touches all scream Karas Kustoms. For me the Decograph puts Karas Kustoms in a place where I feel like I can really use their pens. Their past alumiunium pens, while they are solid and great to use, are too clunky for long term use. By expanding out and using a different material and pairing it with aluminium is a great idea and potentially opens Karas Kustoms up to a whole new market. The Decograph has become my favourite Karas Kustoms pen and one that I will use over and over again. I’d like to thank Karas Kustoms for sending me the Sleeping Beauty fountain pen to review here on the blog.